Coventry City Former Players Association's ‘special guest’ for Saturday’s Sky Blues home game at the Ricoh against Walsall is former Sky Blue midfielder Craig Pead. Craig began as a Sky Blues schoolboy in 1997 and, having turned professional, was a defeated F.A.Youth Cup finalist for the Club in 1998-99. 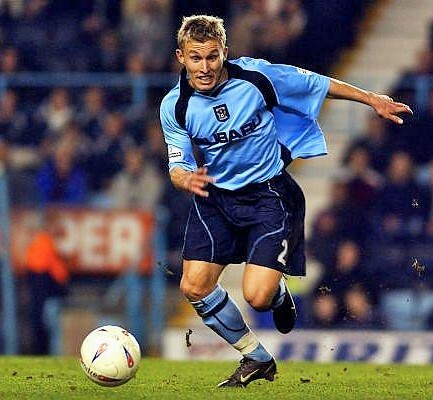 He made his Division 1 midfield debut in a 1-0 defeat at Burnley in 2002 and by the time he left for Walsall in 2005 (after a loan spell there and at Notts County) he had clocked up 45 first appearances for the Sky Blues (3 goals). He also represented England at U18 and U20 levels whilst with City. After two seasons at Walsall Craig moved to Brentford (2007) and turned down a move to Port Vale (2008) and though trialling for Cheltenham Town and Redditch Town in the 2008-09 season remained with the Bees until a knee injury eventually forced his retirement from top level football in May 2009. He got a few outings in non-league football with both Coventry Sphinx and Redditch United between 2010-11. Craig is currently Business Development Manager at BPMpro Sports as well as offering football coaching and personal training. Craig supports CCFPA functions when he can and has attended the Sky Blues Wembley final appearances in the last two years as well as a number of League games and our Legends Day reunions. 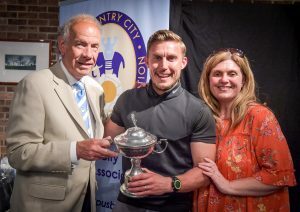 A keen golfer, Craig was also presented with this year’s individual Former Player prize at Golf Day 2018 last June for the best score of all the participants! If you are going to the game, look out for Craig pre-match in CCFC’s Family Zone at the Ricoh. He will also be touring the supporter’s lounges with club host and fellow former Sky Blue Brian ‘Harry’ Roberts for some entertaining Q&A and this will continue after the game down in the G-Casino where CCFPA Vice chairman Billy Bell will, no doubt, be subjecting Peady to some amusing banter and post match review in front of fans. If you can’t make the game you can still hear Craig’s words of wisdom via the BBC CWR airwaves as he assists the station’s live matchday commentary team interpret the game as it unfolds.